If the grid went down today, would you be able to get water without electricity? Because when the power goes out, so does your well pump. The water stops coming in. If the grid goes down for a long time or becomes unreliable… you don’t want to be at the mercy of the powers that be. And having a shallow well hand pump is my emergency plan for securing a stable source of water when my main pump stops working. Side note: installing a shallow-well water pump is also a good way to retain access to your water supply in the winter – when the surface is frozen. Since you found this page, I’m going to assume that you have access to water on your property. Whether it’s a river flowing through your property or a pond that you have access to. Well, consider yourself lucky. Most people are limited to water storage and relying on filters/boiling when that storage runs out. We are fortunate – but only if we learn to take advantage of that. 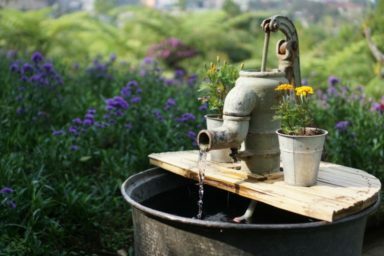 A simple manual pitcher pump can provide for the needs of a small home & garden. And here is my experience with choosing, buying, installing, and using one. Why did I get a shallow well hand pump in the first place? I have a river on my property. A few years back I dug a shallow well to have access to it and use the water daily. I had a quality electric pump installed and crossed this task off my list. But then I realized that if my electricity goes away, so does my water. And that’s when I decided to get a hand pump. 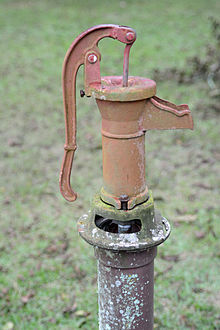 Of course, I researched the hell out shallow well hand pumps beforehand. At the end of the day, there is nothing complicated about it. There aren’t many shallow well water pumps on the market. And installing them is pretty straightforward. Still, it’s surprisingly difficult to find information about them. And so, I had to spend a few hours on forums. So today, I’m going to share with you everything that I learned about shallow wells, pumps, and installing them. After doing my research, I ended up going with a basic Simmons Pitcher Pump. Simmons is a household name for pumps. They used to manufacture in the U.S. but have since moved their production to China. To keep the costs down. There’s nothing fancy about this pump, but it’s a steady workhorse and does what it should. I’m completely satisfied with its performance so far. The pump is rated for up to 25 vertical feet. My well has a stable water depth of about 17 feet. Everything works fine. You can also attach the pump to a cistern. Anything that can take a PVC hose, basically. Simmons pumps well – not too light and not too heavy. For what I’m using it for, I don’t get too tired. It’s your standard hand pump. You probably know this, but the deeper the water is, the harder it is to pump it. With my depth of ~17ft. my wife has no trouble pumping with it. If she can do it, so can you. The pump is made of cast iron with reinforced bolt lugs. The metal feels sturdy and rugged. Just as it should. Leather gaskets will reportedly last for a few years. They will dry up if you don’t use the pump for extended periods. So make sure you pump it at least once a few days. With that being said, you can get replacement gaskets from Amazon real cheap. The handle can be rotated to any position, so you don’t need to worry about the placement too much. Note: You need to soak the pump for 30-45min before use. I had to call the company to find this out, as it’s not stated anywhere in the instructions. It’s not the best pump on the market, but unless you want to spend hundreds of dollars on a pump… Simmons is the way to go. As I said, I haven’t had any problems with this pump. From what I’ve read online, that’s also the case for most people. Still, some people have reported problems with Simmons’ quality control. Paint chipping off and the pump rusting. On the other hand, they might have just installed the pump wrong. I did everything according to instructions and mine’s had no problems. The bottom line is – there is no real alternative to this pump at this price point. If you hear of someone making a better pump than Simmons, please let me know in the comments and I’ll include it. Disclaimer: I don’t have the Bison pump. This is only the information that I’ve been able to find while researching. If you do want to spend hundreds on your pump… Bison is the way to go. They make some of the best pumps available on the market. Including pumps for shallow wells. Bison is like like a Ferrari of water pumps if you will. Priced like a Ferrari, too. Side note: They started out in ’99 after ice storms in Maine killed a lot of livestock. Water sources were frozen, and farmers couldn’t get water to their animals. Full stainless steel construction is sturdier than just about any other pump out there. Bison pump won’t rust under any circumstances. When I looked at the price tag … I couldn’t justify paying that much. It’s nearly x10 as expensive as my Simmons. …but for a shallow well pump? Why would you pay that much? Now, if you do have an unlimited budget and you absolutely want the best pump on the market – you can go with Bison (here’s their latest model for shallow wells). Otherwise, I’d recommend you to stick with Simmons – a proven workhorse. I did the installation myself and it cost me next-to-nothing. If you have an existing well, all you have to do is screw on a 25′-30′ long drop-pipe (PVC) and drop it into the well. And you’re done. At the end of the day, hand pumps only have one reliable advantage – reliability in case of a power failure. If you use a lot of water, you’ll just get tired of pumping it all the time. There are hand pumps meant for large quantities. But let’s be honest – an electric pump will save you a lot of headache. I’ve had this Red Lion for a while now and it works like a charm. Can’t even compare it to the hand pump – it’s a whole different class of performance. If you don’t have an electric pump yet (and have an opportunity to use one), I highly recommend that you look into it. Your quality of life will improve significantly and it’s well worth the money. Shallow well means that the water level maximum 20-25 ft. down from the surface. Deep well is anything deeper than 25 ft. Deep well pumps go up to 350 ft. below the ground. In theory, shallow well pumps can reach about 25ft. down. But if your well is any deeper than 20ft, you should be looking at deep well pumps. Because the water level won’t stay constant at all times. If you have 22ft. of depth on a good day… you might easily have 26ft. on a bad day. If you can’t reach your water with the pump, why get it in the first place? The #1 thing your hand pump needs to be is reliable. Don’t take chances with getting a pump that won’t reach your water. If you haven’t yet, confirm that your well depth is no more than 20ft. down. I hope that you already know this, but remember to filter/boil all water that you get through your pump.